This article is about R.O.B. 's appearance in Super Smash Bros. 4. For the character in other contexts, see R.O.B..
R.O.B. 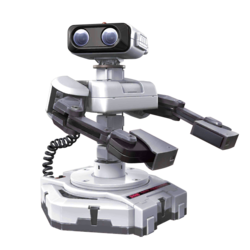 (ロボット, Robot) is a playable character in Super Smash Bros. 4. After initially being leaked on August 19th, 2014 as part of the ESRB leak, his return to the series was officially announced on SSB4's official website on October 9th, 2014, during which Ganondorf was also announced. R.O.B. is currently ranked 36th out of 55 on the tier list, placing him in the D tier. This is a moderate drop from his placement in Brawl, where he was ranked 18th out of 38. R.O.B. 's boasts a strong zoning game and recovery: Robo Beam and Gyro are chargeable, long-ranged projectiles, while Robo Burner is versatile; covers impressive overall distance; and is complimented by his much faster air speed. R.O.B. also possesses a strong air game, thanks to all but one of his aerials having disjointed hitboxes, alongside a capable grab game. Despite being a heavyweight, R.O.B. 's overall mobility is also respectable. Notably, R.O.B. 's once poor KO potential has been significantly improved, thanks to receiving a number of strong KOing options. However, R.O.B. 's ground game lacks range compared to his air game. This is most obvious with his arm-based attacks, especially in regard to his overall grab range, which is now the shortest ranged in the game. While it is still strong, R.O.B. 's zoning game has also been somewhat toned down, as Robo Beam is slower and Gyro deals significantly less damage. R.O.B. is also susceptible to combos because of his heavy weight and large size. Lastly, his newfound KOing options are hindered by noticeable amounts of start-up lag. Overall, R.O.B. has become somewhat more viable since Brawl, thanks to him largely retaining his strengths and having noticeably improved KO potential; yet, the larger competition present and many of the tools the new characters possess harm R.O.B more than they did in Brawl, thus resulting in his lower tier position relative to the cast. To reflect him becoming stronger as a character, he has achieved overall average tournament results, and has gained a number of dedicated players to his credit. After completing one of the two methods, R.O.B. must then be defeated on PictoChat 2. Play through 10 rounds of Crazy Orders and defeat Crazy Hand. After completing one of the two methods, R.O.B. must then be defeated on Wrecking Crew. R.O.B. is the tenth heaviest character in the game, yet he possesses respectable overall mobility in spite of his weight class. This is thanks to his average walking and dashing speeds; above-average air, falling and fast falling speeds; slow air acceleration; high traction, jump and double jump; and low gravity. Altogether, these attributes allow R.O.B. to outmaneuver some of his fellow heavyweights; make him almost as mobile as a middleweight; and grant him better jumping prowess than most characters of either weight class. Like in Brawl, R.O.B. is a zoning-oriented character with very useful projectiles to keep his opponents at bay. Robo Beam enables him to attack from considerable distance, and becomes the noticeably stronger Super Robo Beam when it is left idle for 14.3 seconds. While Robo Beam interrupts opponents faster, Super Robo Beam deals more damage and has higher knockback growth. Gyro is an auto-chargeable projectile that becomes an item when fired. Compared to Robo Beam, it has a more favorable angle for disrupting opponents, while also being more manipulable as a projectile and having greater KOing potential. Thanks to R.O.B. 's item throws being among the strongest in the game, Gyro is also very useful when smash thrown as an item. Aside from his offensive prowess with projectiles, R.O.B. also does not have issues against projectiles, courtesy of Arm Rotor's ability to reflect them with greater strength than they initially had. In addition to its reflection ability, Arm Rotor now boasts KO potential, thanks to its finishing hit having significantly higher knockback growth. R.O.B. 's air game is also strong, thanks to the excellent and disjointed ranges of all but one of his aerials. Neutral aerial has large, disjointed hitboxes that make it a reliable combo starter at low to medium percentages when SHFF'd, as well as a useful spacing option. Up aerial is one of R.O.B. 's best moves overall, thanks to its usefulness in harassing airborne opponents by either juggling or KOing them. Back and down aerials are R.O.B. 's most damaging aerials when sweetspotted, and have large hitboxes like neutral aerial. However, they also boast specific strengths: the former has recovery potential thanks to it propelling R.O.B. forward slightly, whereas the latter is a meteor smash. Lastly, forward aerial is arguably R.O.B. 's least useful aerial because of its hitbox having much shorter range and not being disjointed. However, it is R.O.B. 's fastest aerial, which makes it reliable for spacing, especially when SHFF'd, as well as edge-guarding. Unlike in Brawl, R.O.B. now boasts respectable KO potential. Like his up aerial, back aerial, up throw and Arm Rotor, R.O.B. 's smash attacks now boast KO potential, thanks to being buffed in various ways. Forward smash's sweetspot deals slightly more damage and higher knockback. Although forward smash's other hitboxes deal less damage, they have been re-positioned farther outward, which improves its range. Up smash's sweetspot and down smash also deal more damage and, like forward smash, have had their hitboxes tweaked for the better: up smash now has hitboxes on R.O.B. 's arms that launch the opponent into its thruster hitboxes, whereas down smash is now a semi-spike. R.O.B. 's grab game has also improved. Forward and back throws are still limited in regard to utility, but are nevertheless decent for spacing and setting up edge-guards. In comparison, R.O.B. 's up and down throws are much more useful. Up throw is his most damaging throw; a viable KOing option, especially when boosted by rage; and can even be used for combos at low percentages. In comparison, down throw deals respectable damage, and is a reliable combo starter into his up aerial from 0% to medium percentages. Although R.O.B. possesses a number of useful traits, he also has some noteworthy shortcomings. Despite his KO potential's drastic improvements, landing his KOing options can still be problematic because of them being laggy and/or having unimpressive ranges. The latter trait is particularly noticeable in regard to R.O.B. 's arm-based attacks, most of which have hitboxes that have either become smaller and/or tweaked for the worse. For example, his grab game is hindered by his overall grab range now being the shortest in the game because of his much smaller grabboxes, whereas his up tilt has drastically less utility because of its adjusted hitboxes. In addition to R.O.B. 's hitbox issues, his hurtbox also hinders him, as it has become larger since Brawl. When coupled with his faster falling speed, he is much more susceptible to combo-oriented characters, such as Luigi and Zero Suit Samus. This is further compounded by his aerials' inability to reliably break combos: neutral and down aerials are too slow, forward and up aerials only hit in front of and above R.O.B., respectively, and back aerial has both slow start-up and only hits behind him. While R.O.B. 's zoning game remains his greatest strength, the universal nerf to projectile camping has somewhat toned it down. Gyro, in particular, has been the most adversely affected of his projectiles: in addition to retaining its susceptibility to being stolen, a fired Gyro deals drastically less damage and covers less range. The removal of glide tossing also significantly hinders its approach potential. Robo Beam's nerfs are not as severe in comparison, but are nevertheless noticeable: it now deals slightly less damage, and both it and Super Robo Beam travel slower. As a a result of these nerfs, R.O.B. now has a more difficult time dealing with most characters that have better projectiles (such as Sheik and Diddy Kong); attacks that counteract his own projectiles (such as Fox and Falco); or both (such as Villager). R.O.B. 's custom moves can alleviate many of his weaknesses. Wide Angle Beam, true to its name, can be aimed in a much wider arc, which enables R.O.B. to catch aerial opponents easily. However, it deals slightly less damage. Infinite Robo Beam, also true to its name, can be shot infinitely. This allows R.O.B. to use his zoning game constantly and defend himself. However, it also deals less damage, cannot ricochet, and Super Robo Beam needs to charge for longer. Reflector Arm acts like a traditional reflector, having a higher reflection multiplier and longer duration. However, R.O.B. will not move when using it, preventing him from pressuring the opponent. Backward Arm Rotor has a shorter duration, but is a very effective defensive option, as it moves R.O.B. backward, and comes out much faster (contrary to what its description suggests). High-Speed Burner has less fuel, but allows R.O.B. to recover more easily due to its increased aerial movement. Robo Rocket functions like a traditional recovery move, launching R.O.B. upwards, and can even meteor smash. However, it cannot be used in bursts; covers less horizontal distance; and its meteor smash is weak. Fire Gyro deals more damage, but covers less distance when fired. Slip Gyro slides across the stage, making it more predictable, but trips opponents when the Gyro hits them, giving R.O.B. access to many follow-ups. Overall, R.O.B. is a defensive character that still possesses a strong zoning game, but now wields improved close-range offense. While R.O.B. now has to use close quarters combat more frequently because of his playstyle now being less reliant on his projectiles, he can now effectively KO opponents without having to rack up an outstanding amount of damage. As a result, he has become a more potent character than he was in Brawl and has some dedicated and noteworthy mains to his credit, such as Holy, Mister Eric and 8BitMan. R.O.B. has received both buffs and nerfs in the transition from Brawl to SSB4. The most prominent buff was to his KO potential; many of his KOing options in Brawl have become more powerful and/or slightly easier to land, while other moves have been strengthened to the point of possessing KO potential, such as his up aerial and up throw. R.O.B. also benefits from the re-balancing of other characters who countered him in Brawl, most infamously Meta Knight, and he has become slightly better equipped to handle the new characters that are commonly seen in the competitive scene. R.O.B. also received some nerfs, however. His powerful zoning game has been hampered due to SSB4 removing glide tossing, while his projectiles and spacing tools having been made slower and/or given shorter ranges. This makes approaching more important, as R.O.B. is now less capable at projectile trading. When combined with his aerials' effectiveness being toned down since Brawl, R.O.B. is largely forced to engage in a mix of zoning and close quarters combat in order to score KOs. His recovery was also slightly toned down, as it is now slower and easier to punish. R.O.B. 's design has slightly changed. His body now has a satin finish, instead of a polished finish; his gray-colored components are darker; his head is slightly smaller; and his eyes are slightly larger and have more defined lenses. Altogether, these changes make R.O.B. appear significantly more in line with his appearance as a real life video game peripheral. R.O.B. has received two new alternate costumes. R.O.B. now faces the foreground at an angle, instead of facing directly forward. He will also always turn to the right when performing all of his taunts, regardless of whether he is facing left or right. R.O.B. is more expressive. He appears angry while charging his up and down smash attacks, and during his down throw and Arm Rotor. R.O.B. also appears sad when he is grabbed. As of update 1.1.7, R.O.B. does not emote whatsoever in Versus Mode. However, he emotes properly in single-player modes, such as Training Mode. R.O.B. 's mechanical sound effects are lower pitched. R.O.B. is larger. This makes his hurtbox larger. While this would also improve his overall range, this is slightly mitigated by some of his moveset having smaller hitboxes. R.O.B. walks faster (1.1 → 1.122). R.O.B. dashes faster (1.5 → 1.568). R.O.B. 's air speed is faster (0.89 → 1.08). R.O.B. falls faster (1.2 → 1.6). This improves his vertical endurance, but makes him more susceptible to combos. Arm-based attacks now emit visual trails that match R.O.B. 's selected color scheme. The changes to hitstun canceling both help and hinder R.O.B. They significantly improve his combo potential, but make him more susceptible to combos. Neutral attack has smaller hitboxes. Neutral attack has updated sound effects. Tip forward tilt has a smaller hitbox. Arms' tip and arms' base up tilt have significantly smaller hitboxes. Due to their angles being altered, they also no longer launch opponents into its tip's hitbox. Altogether, these changes significantly hinder its utility. Tip up tilt has a slightly larger hitbox. Down tilt has a shorter duration (frames 3-4 → 3). Dash attack deals 2% more damage (6% (arms)/5% (arms' tips) → 8%/7%) and has increased range, improving its spacing potential. Base forward smash deals 1% more damage (14% → 15%) and has increased knockback, improving its KO potential. Forward smash also has a slightly larger hitbox, and its mid and tip hitboxes have been re-positioned farther outward. Altogether, these changes improve its range. Mid and tip forward smash deal less damage (13% (mid)/12% (tip) → 11.5%/6%) and have smaller hitboxes. Forward smash also has increased start-up lag (frame 14 → 16). Forward smash's animation has changed. R.O.B. now leans forward and positions his arms downward for support in order to fire the optical energy blast. His head also now rotates when it is charging. Forward smash has updated sound effects. Base up smash deals 2% more damage (12% → 14%), improving its KO potential. Its hitbox and up smash's tip hitbox have also been re-positioned further upward, improving its range. Up smash's mid hitbox has been removed and replaced with hitboxes on R.O.B. 's arms that deal 3% and launch opponents at 111°. These changes significantly improve its reliability, and grant it out of shield potential. Tip up smash deals 1% less damage (14% → 13%), hindering its KO potential. It also has a smaller hitbox. Base and tip up smash have increased start-up lag (frame 13 → 14) and shorter durations (frames 13-18 → 14-18). Down smash deals 2% more damage (2% (hits 1-4)/5% (hit 5) → 4%/7%), significantly improving its KO potential. Down smash also has larger hitboxes. Down smash has increased start-up lag (frame 4 → 7). Due to its angle being altered, down smash is now a semi-spike, significantly improving its edge-guarding potential. The weakening of SDI makes down smash significantly more difficult to escape from. Neutral aerial deals 2% less damage (10% → 8% (base)/6% (tip)) and has decreased knockback growth (108 → 100 (base)/98 (tip)). When coupled with the changes to hitstun canceling, these changes grant it combo potential. However, these changes significantly hinder its KO potential. Base neutral aerial has significantly smaller hitboxes. Due to consisting of a consistent hitbox instead of a clean hitbox and a late hitbox, forward aerial now deals consistent damage (10% (clean)/6% (late) → 7%). It also has decreased knockback. When coupled with the changes to hitstun canceling, these changes improve its combo potential. However, these changes significantly hinder its KO potential. Forward aerial has decreased start-up lag (frame 7 → 6). Forward aerial has has a smaller hitbox; increased ending (frame 33 → 36) and landing lag (12 frames → 15); and a shorter duration (frames 7-17 → 6-7). Due to R.O.B. 's faster falling speed, forward aerial can no longer be performed twice with a short hop. Due to consisting of sweetspots and sourspots instead of a consistent hitbox, back aerial no longer deals consistent damage (11% → 12% (clean base)/10% (clean tip)/6% (late base)/4.5% (late tip)). Clean back aerial has more base knockback compared to the previous hitbox (30 → 32). Back aerial's hitboxes are positioned farther outward, improving its range. It also propels R.O.B. slightly farther, improving its recovery potential. Back aerial has increased start-up (frame 11 → 19); ending (frame 41 → 53); and landing lag (12 frames → 22). It also has a shorter duration (frames 11-25 → 19-29). Back, up and down aerials auto-cancel later (frame 26> → 46> (back), frame 36> → 40> (up), frame 27> → 45> (down). Up aerial's loop hits deal less damage (4%/5% → 1.5%), which decreases its overall damage potential (19%/20% → 10%). Up aerial's last hit deals 1% more damage (3% → 4%) and has altered knockback (60 (base)/120 (growth) → 45/180), granting it KO potential. The weakening of SDI makes up aerial significantly more difficult to escape from. Mid down aerial deals 2% less damage (13% → 11%) and has decreased base knockback (30 → 20). Down aerial has received a late hitbox that deals 8% and launches at 361°. This lengthens its duration (frames 20-24 → 20-26), but makes it more susceptible to punishment at low to medium percentages. Down aerial has slightly larger hitboxes, and its hitboxes have been re-positioned farther downward. These changes improve its range. When coupled with the updated edge mechanics and the removal of meteor canceling, these changes also significantly improve its reliability. Mid down aerial no longer meteor smashes grounded opponents. All grabs have significantly smaller grabboxes. Standing and pivot grabs have increased start-up lag (frame 6 → 7 (standing), frame 10 → 11 (pivot)). Forward throw deals 2% less damage (10% → 8%) and has decreased knockback. Up throw deals 2% more damage (10% → 12%) and has increased knockback growth, improving its KO potential. The changes to hitstun canceling grant up throw combo potential at low percentages. They also significantly improve down throw's combo potential at low to medium percentages. R.O.B. has a new edge attack, a fiery blast from his thrusters. Uncharged Robo Beam deals 2% more damage (5% → 7%). Robo Beam deals 1% less damage (5% → 4%). Super Robo Beam deals 1% more damage (9% → 10%) and has increased knockback. It also charges faster (1220 frames → 860). Robo Beam and Super Robo Beam travel slower. Super Robo Beam's visual effects have changed. It is now wide and whitish yellow with a whitish crimson outline and cerulean trail, instead of being thin and whitish crimson. Arm Rotor now deals consistent damage (1%/2% (loop)/3%/4% (last) → 1%/3%), although its last hit's knockback was compensated. This grants it KO potential, but hinders its damage racking potential. Arm Rotor now covers significantly more distance when moved forward or backward, improving its approach potential and safety. The weakening of SDI makes Arm Rotor significantly more difficult to escape from. Robo Burner's horizontal movement speed is slower and repeated bursts cover less distance, hindering its recovery potential. Fully charged Gyro deals 8% less damage (18% → 10%) when fired. Gyro's firing range has also decreased. Gyro's animation has changed. R.O.B. now recoils slightly when failing to pull a Gyro from his base. This new animation is significantly laggier. Gyro has updated sound effects. It now emits a whirring sound while spinning by itself on-stage. The removal of glide tossing significantly hinders Gyro's approach potential. R.O.B. has a new Final Smash, Super Diffusion Beam. R.O.B. re-configures his body into a cannon-like form in order to fire a large laser that fans out into smaller lasers that trap the opponent before concluding and then being immediately followed by a large energy blast. Compared to Diffusion Beam, Super Diffusion Beam deals less damage overall and has a shorter duration, but deals more knockback and has more range. Unlike Diffusion Beam, Super Diffusion Beam forces R.O.B. to be stationary throughout its duration. Like Mario and Pit, R.O.B. has received a very small number of direct changes from game updates. Update 1.0.4's changes to vectoring indirectly buffed him by enabling his Beep Boop combo (Up-Throw -> Up-Air) to function past low percentages, and even as a KO combo. However, update 1.0.6 notably decreased the knockback of R.O.B. 's up throw. This hindered its KO potential to the point that it now KOs roughly 20% later; previously, it was the strongest up throw in the game, and the second strongest throw of any kind after Ness' back throw. Despite this, up throw remains a viable KOing option, especially on platforms. Its lower knockback has also granted it combo potential at low percentages; when coupled with its launching angle, its combos are also more varied and less susceptible to directional influence compared to down throw's. As a result, up throw can now be used to conserve the freshness of both down throw and up aerial for later combo and KO attempts, respectively. Update 1.1.1's increase to shieldstun indirectly nerfed R.O.B. : in addition to making him easier to punish out of shield because of his fastest moves having low damage outputs, it worsened his already unimpressive out of shield game. Lastly, update 1.1.4 increased the size of R.O.B. 's hurtbox and decreased his tripping stance's invincibility frames by standardizing it. Although updates 1.1.3 to 1.1.6 notably nerfed some of R.O.B. 's more difficult matchups, such as Bayonetta, Cloud, Diddy Kong, Sheik and Zero Suit Samus, they nevertheless remain challenging. On a related note, these updates have also made some of R.O.B. 's other matchups less favorable, most notably Lucina, Marth and Mewtwo. Due to remaining relatively static throughout SSB4's lifespan, as well as most of the cast becoming more viable via game updates, R.O.B. is less effective than he was during the initial release of SSB4. Fixed a glitch where throwing Gyro upward while using Robo Burner could cause the flames to continue emitting from R.O.B. 's base after Robo Burner concluded. Up throw's knockback decreased: 70 (base)/72 (growth) → 60/70. This grants it combo potential at low percentages, but significantly hinders its KO potential. R.O.B. 's hurtbox sizes have been increased and adjusted. 3% Two alternating hooks. Both of its hits hit on frame 3, which ties it with down tilt as R.O.B. 's fastest attack. Its first hit has almost nonexistent base knockback, average knockback growth and launches at 100°, all of which allow it to jab cancel. Its most reliable follow-up is down tilt, thanks to it also hitting on frame 3, although it can also jab cancel reliably into forward tilt, smash attacks, or a grab. The tilt attack follow-ups can be performed up to high percentages, while the smash attack and grab follow-ups can be performed on lightweights and middleweights beginning at 80%-85% and heavyweights beginning at 110%-115%. However, it cannot jab cancel reliably against fast-fallers. Conversely, its second hit has very high knockback growth and launches at 361°, which make it useful for spacing. 8% (arm's tip), 6%/5% (arm) A lunging hook. It can be angled and the tip of R.O.B. 's arm is decent for spacing beginning at 50%. 3% (early), 5% (clean tip), 6% (clean base) Thrusts his arms upward. It is good for starting combos into itself, up smash and up aerial from low to medium percentages, or functioning as an anti-air attack. However, it has very minimal horizontal range, which forces R.O.B. to practically stand next to a grounded opponent in order to land it. 5% Thrusts his arms at a low angle. It hits on frame 3, which ties it with neutral attack as R.O.B. 's fastest attack. Although it has a small chance to trip opponents, its overall fast speed largely offsets this and makes it an excellent set-up option. 8% (arms), 7% (arms' tips) A double forearm club. It can be followed up with forward aerial if the opponent's reaction is read properly. S3 15% (base), 11.5% (mid), 6% (tip) An optical energy blast, similar to the uncharged Robo Beam. It can be angled; has very knockback growth; and its base hitbox deals respectable damage. Altogether, these enable it to KO middleweights at 109% near the edge. Although slightly weaker, its middle hitbox is still strong enough to KO middleweights at 136% near the edge. However, its range is merely average at best, it has high ending lag and the blast's tip has extremely minimal KO potential. 3% (arms), 14% (base), 13% (tip) Performs a handstand and activates his thrusters to emit a fiery blast upward. It hits on frame 10, which is somewhat fast for a smash attack. It also has deceptive horizontal range on the ground, thanks to R.O.B. 's arms having hitboxes that launch opponents into the thrusters' hitboxes, the latter of which are fairly powerful. Its base KOs middleweights at 113%, whereas its tip KOs them at 116%. Altogether, these traits make it a reliable KOing option, especially from out of shield because of R.O.B. 's high traction. However, it has high ending lag. 2% (hits 1-4 base), 1.5% (hits 1-4 tip), 5% (hit 5) Lowers his torso and spins it around rapidly while outstretching his arms to perform a series of discus clotheslines, similarly to Arm Rotor. It hits on frame 7, which is very fast for a smash attack. Thanks to it being a semi-spike and its last hit's very high knockback growth, it KOs at middleweights at 129% while near the edge, and is very effective for edge-guarding. However, its base hitboxes launch the opponent behind R.O.B., which means that he must face away from the edge when attempting to use this move in order to properly launch the opponent off-stage. Like forward and up smash, it also has high ending lag. 8% (base), 6% (tip) Activates his thrusters to somersault and emit a fiery blast in a circular motion. Its large hitbox, very minimal landing lag and ability to auto-cancel with a short hop collectively make it very useful for spacing, approaching and starting combos. Due to it hitting on frame 18, however, it is punishable if it is not spaced properly. 7% A double forearm club. It hits on frame 6, making it R.O.B. 's fastest aerial. It is also ideal for spacing when SHFF'd, has minimal landing lag and is decent for edge-guarding. However, it lacks KO potential because of its average damage output and very low base knockback. It is also R.O.B. 's only aerial that does not have a disjointed hitbox. 12% (clean base), 10% (clean tip), 6% (late base), 4.5% (late tip) Leans forward and activates his thrusters to emit a fiery blast behind himself. Its clean base hitbox is strong enough to KO middleweights at 126% while near the edge, thanks to its respectable damage output and very high knockback growth. Back aerial can also be used for horizontal recovery, as it slightly propels him forward and does not consume Robo Burner's fuel. Due to it hitting on frame 19 and having 22 frames of landing lag, it is punishable if it is not spaced properly and auto-canceled. 1.5% (hits 1-4), 4% (hit 5) Rapidly rotates his arms upward. It hits on frame 7, making it R.O.B. 's second fastest aerial. It is down throw's most reliable follow-up from low to medium percentages. It is also useful for juggling and KOing, as its loop hits keep the opponent trapped reliably, whereas its last hit's extremely high knockback growth enables it to KO middleweights at 115% while near the upper blast line. It can also auto-cancel with a short hop. However, it has 22 frames of landing lag like back aerial, which makes it punishable if it is not auto-canceled. 12% (clean base), 11% (clean mid), 6% (clean tip), 8% (late) Activates his thrusters to emit a fiery blast downward. The middle portion of the blast is a powerful meteor smash, which makes it a very potent edge-guarding option, especially after an edge trump if the opponent re-grabs the edge. It can also auto-cancel with a short hop. Due to it hitting on frame 20 and having 43 frames of ending lag, it is R.O.B. 's slowest aerial. When coupled with its 21 frames of landing lag, it is punishable if it is not spaced properly and auto-canceled. — Clinches the opponent. Due to his grabboxes being significantly smaller than in Brawl, R.O.B. 's overall grab range is the shortest in the game. 2% Squeezes the opponent. A fairly fast pummel. 8% Shoves the opponent away. It can be used to set up an edge-guard. 10% Flings the opponent away. Like his forward throw, it can be used to set up an edge-guard. 12% A jumping reverse piledriver. R.O.B. 's strongest throw and, prior to update 1.0.6, it was the strongest up throw in the game, as it was capable of KOing under 150%. As of update 1.0.6, it now KOs middleweights at 174%, although platforms assist its KO potential considerably: it KOs middleweights at 160% when used on Battlefield's low platforms, and KOs them at 145% when used on Battlefield's top platform. Although rare, R.O.B. can also use up throw for a suicide KO if it is performed on a moving platform, as he will continue performing the throw all the way to the lower blast line if there is no platform to stop his descent. In addition to its KO potential, it has combo potential thanks to it launching at 80°, with its follow-ups being upward angled forward smash, dashing up smash, forward aerial, and up aerial from 0%-40%. However, its smash attack combos are most reliable against heavyweights and fast-fallers. 10% Drills the opponent into the ground headfirst. It has very high base knockback, very low knockback growth and launches at 88°, which collectively enable it to combo into neutral and up aerials at low to medium percentages. The latter combo has been nicknamed the "Beep Boop" and can even function as a KO set-up at high percentages if R.O.B. can properly read the opponent's reaction. However, its neutral aerial combo is only reliable beginning at 0%, whereas the "Beep Boop" can be avoided if the opponent DIs horizontally after being thrown. 7% Punches around himself while getting up. 5% Spins his torso around to throw a low-angle hook around himself while getting up. 7% Swings his base forward and activates his thrusters to emit a fiery blast forward while climbing up. Default Robo Beam 7% (uncharged), 4.5% (Robo Beam), 11% (point-blank Robo Beam), 10% (Super Robo Beam), 17% (point-blank Super Robo Beam) An optical laser. When uncharged, it is a very small energy blast instead of a laser, and can only damage opponents at point-blank range. However, it can be fired consecutively and has deceptively high knockback growth, which allow it to ward off nearby opponents. Conversely, both Robo Beam and Super Robo Beam can damage opponents from afar and ricochet, but cannot be fired consecutively. Robo Beam and Super Robo Beam also deal noticeably more damage when fired at point-blank range. It is one of R.O.B. 's options for zoning alongside Gyro, with Robo Beam being better for his neutral game, while Super Robo Beam is better for surprising opponents. It and all of its custom variations have transcendent priority. Uncharged Robo Beam becomes Robo Beam after being left idle for 2.6 seconds (160 frames), and Robo Beam becomes Super Robo Beam after being left idle for 14.3 seconds (860 frames). Custom 1 Wide-Angle Beam 7% (uncharged), 3.5% (Robo Beam), 10% (point-blank Robo Beam), 8% (Super Robo Beam), 15% (point-blank Super Robo Beam) R.O.B. can aim on a much wider arc, but at the cost of Robo Beam and Super Robo Beam having slightly lower damage outputs. Custom 2 Infinite Robo Beam 3%/2% (Robo Beam), 7% (point-blank Robo Beam), 10% (Super Robo Beam), 14% (point-blank Super Robo Beam) Robo Beam can be fired consecutively, but at the cost of a lower damage output, shorter range and its ability to ricochet. These drawbacks also apply to Super Robo Beam, which also takes longer to charge. Default Arm Rotor 1% (loop), 3% (last), 1.5× (reflected projectiles) Rapidly spins his torso around to perform a series of discus clotheslines that concludes with an uppercut. Mashing the special button extends the duration of the move. Unlike in Brawl, it can trap opponents reliably and its last hit has KO potential, thanks to its extremely high knockback growth enabling it to KO middleweights at 147% while near the edge. It can also reflect projectiles with 50% more power than they originally had, and move R.O.B. forward or backward while the control stick/circle pad is tilted in the respective direction. It and all of its custom variations have transcendent priority. Custom 1 Reflector Arm 2% (loop), 4% (last), 1.8× (reflected projectiles) Deals more damage and reflects projectiles with 80% more power than they originally had, but at the cost of its trapping ability. Custom 2 Backward Arm Rotor 2% (loop), 4% (last), 1.5× (reflected projectiles) Deals more damage and moves R.O.B. backward while it is being performed, making it better suited for defense, but at the cost of having a significantly shorter duration overall. Default Robo Burner — Activates his thrusters in order to fly. It grants impressive vertical and horizontal recovery distance, although R.O.B. has a set amount of fuel to use in order to perform this move. Fuel is recovered over time as long as R.O.B. is grounded. It is one of the very few up specials to not cause helplessness, which allows R.O.B. to fast fall, air dodge, or attack with any aerials or any of his other specials either through its duration or after its conclusion. However, he is only capable of aerials until at least one has been performed, canceling Robo Burner. R.O.B. is also immune to footstool jumps while using this move, although other characters can still jump off of him regardless. It also grants intangibility on frames 2-4, but only when performed on the ground. Custom 1 Robo Rocket 5% (early), 8% (clean) Functions like a traditional recovery move, as R.O.B. simply ascends quickly and deals damage. It grants outstanding vertical recovery after a jump; does not cause helplessness; can be followed up with any aerial; and can meteor smash if it hits the opponent precisely. However, it grants very minimal horizontal recovery distance. R.O.B. also cannot fast fall, air dodge, or use his other specials as follow-ups. Additionally, its meteor smash has below-average power. Custom 2 High-Speed Burner — Grants faster movement speed, but at the cost of consuming more fuel. Default Gyro 1% (base), 4%-10% (top), 5% (idle top), 8% (thrown) Charges a spinning top on his base. R.O.B. 's other zoning option alongside Robo Beam, it can be picked up and thrown as an item after making contact with either the opponent or the stage. However, opponents can do the same and thus use the top against him. Gyro takes 1.5 seconds (90 frames) to fully charge. Only one Gyro can be active at a time, and attempting another will result in R.O.B. flailing in confusion. It lasts longer when launched with the special button, but once picked up and thrown, it dissipates almost immediately. Typically, Gyro deals little knockback when touched, albeit enough to harass anyone trying to get past. In comparison, it will somewhat launch opponents a short distance toward R.O.B. after being thrown and making contact with the ground again. This enables it to partake in combos if R.O.B. is able to time his attacks and predict his opponent's movements. Due to being an item, however, it can also be grabbed by an opponent and thus used against R.O.B. Custom 1 Fire Gyro 7% (base), 3%-12% (top), 6% (idle top), 10% (thrown) The top is aflame, deals more damage and is slightly more powerful, but at the cost of covering less distance and having increased ending lag. Custom 2 Slip Gyro 2% (base), 3% (top), 3% (idle top), 9% (thrown) The top slides along the ground instead of bouncing, enabling it to trip opponents. The longer it is charged, the farther it travels. While its base and thrown damage outputs are slightly higher, the top's damage output is lower. Super Diffusion Beam 0.5%/1% (narrow laser loop/last), 1%/2% (wide laser loop/last), 10% (blast) Re-configures his body into a cannon-like form in order to fire a large laser that fans out into smaller lasers. These lasers trap the opponent and deal damage, before paralyzing trapped victims and ending with a large energy blast. It is excellent for damage racking and can be angled, similarly to Zero Laser. Its blast is also quite powerful, as it KOs middlweights at 70% while near the edge. Portions of R.O.B. 's body descend from the sky and assemble together. Up taunt: Faces the screen and then spins his head and torso in a circle. Side taunt: Faces the screen and sways his head around while emitting flashing sparkles from his eyes. Down taunt: Faces the screen and moves his torso down to his base before spinning it back up into place. Briefly looks toward the screen. Briefly nods off, then shakes his head and wakes up. A remix of Stack-Up's memory mode title screen jingle. Uses Robo Burner, spins and then lands, after which his torso lowers and slowly elevates back into place while spinning his head. Rears back his arms, then rotates them into an upward position while spinning his head, after which he performs a cheering gesture while continuing to spin his head. Sways his head around while emitting flashing sparkles from his eyes, then slightly adjusts his arms and torso. It is almost identical to his side taunt. 8BitMan - One of the two best R.O.B. players in the world. Ranked 8th on the South Florida Power Rankings. Ginko - Placed 3rd at Hyper Sumabato, 4th at KSB 2016, and 33rd at Umebura S.A.T. Gyo - Ranked 10th on the Dallas Fort-Worth Power Rankings. Holy - One of the best R.O.B. players in the world. Formerly ranked 4th on the Montreal Power Rankings. Jams - Ranked 6th on the Alberta Power Rankings, best active R.O.B. in Canada. LoNg0uw - The best R.O.B. player in Europe. Ranked 5th on the German Power Rankings. Mister Eric - Ranked 4th on the Kentucky Power Rankings. OCEAN - The best R.O.B. player in Japan. Raffi-X - One of the best R.O.B. players in the world. Ranked 10th on the New England Power Rankings. Robo~Luigi - Ranked 4th on the Spanish Power Rankings. SaSSy - Ranked 2nd on the Austin Power Rankings. Has wins on CaptainZack and saj. Sim-Max - Ranked 3rd on the Italian Power Rankings. Virus - Formerly ranked 7th on the NorCal Power Rankings. WaDi - The best Mewtwo player with a very strong R.O.B. secondary. One of the best R.O.B. players in the world. Ranked 1st on the MD/VA Power Rankings, and 22nd on the Panda Global Rankings v5. WiiGi - Formerly ranked 15th on the SoCal Power Rankings. Thanks to his potent zoning and grab games, R.O.B. was initially considered a high-tier character during SSB4's release, similarly to initial perceptions of him during the early days of Brawl's metagame. However, after update 1.0.6 nerfed his up throw's power, his reputation declined to the point that he was perceived as a mid-tier character. Nevertheless, R.O.B. 's representation in competitive play remains decent, while the good results he has achieved thanks to the likes of 8BitMan, Holy, Mister Eric, OCEAN and Raffi-X resulted in him being ranked 20th on the first tier list. However, other characters like Donkey Kong, Lucario and, most notably, Toon Link, have achieved much better results than R.O.B. To further compound this, R.O.B. has become rarer in competitive play due to having unfavorable matchups against all but one of the DLC characters. This decline in popularity and results would end up with R.O.B. being ranked 28th on the second tier list, then to 33rd on the third tier list (this drop is notable for being the third highest between the second and third tier lists), and finally to 36th on the fourth and current tier list. For R.O.B. 's Final Smash, he folds his arms down, transforms into an invincible cannon, and fires a huge beam that can be panned slowly up and down. The beam splits up partway through into smaller beams that drags foes to the center, where they'll be hit continuously. The assault finishes off with a single wide beam just for good measure. All-Star Battle: Secret: R.O.B. is one of the opponents fought in this event. All opponents are unlockable characters in previous Super Smash Bros. games. Mechanical Menace: As Shulk, the player must defeat a metal R.O.B., a metal Mega Man and Metal Face in a Stamina Battle. Robotic Rampage: R.O.B. is allied with two R.O.B.s and must defeat a giant metal R.O.B. Robots vs. Dragons: R.O.B. and Mega Man must defeat a giant Yoshi, a giant Charizard and Ridley in a Stamina Battle. The NES design of R.O.B. 's amiibo. 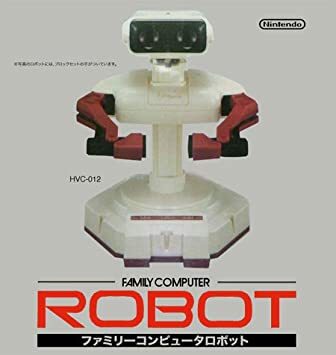 The Famicom design of R.O.B. 's amiibo. Preparing to use his back aerial alongside Meta Knight and Donkey Kong. Using his side taunt while metal and alongside Diddy Kong and Toon Link. Arm Rotor's last hit alongside Kirby and Donkey Kong. Dropping Gyro on a Luma. Preparing to use Super Diffusion Beam, his new Final Smash. Crouching near Gyro alongside Ness and Pikachu. Using his down tilt on Rainbow Road. Preparing to use Robo Burner alongside Olimar. R.O.B. 's NTSC Boxing Ring title, "The Last of His Kind", directly references the fact that he is the only surviving member of his species following the conclusion of Brawl's Adventure Mode, The Subspace Emissary. R.O.B. 's default costume differs between the international and Japanese versions of SSB4. In international regions, his default costume consists of his Nintendo Entertainment System (NES) color scheme, whereas his default costume in Japan consists of his Family Computer (Famicom) color scheme. This affects the color scheme of R.O.B. 's standard trophy, but not his appearances in the Sound Test for Super Smash Bros. for Nintendo 3DS or the Special Orders tickets for Super Smash Bros. for Wii U. His Final Smash trophy and Classic post-credits scenes in Super Smash Bros. for Wii U also use his Famicom color scheme. R.O.B. is the only character in the series with this distinction. This also applied to R.O.B. 's amiibo, although this trend ended when his Famicom design was released internationally on March 18th, 2016. Despite the distinctions, the official website shows R.O.B. 's Famicom color scheme in official artwork, although half of the screenshots show his NES color scheme. Unlike in Brawl, R.O.B. can now be rendered helpless. This can only be done if he lands on Pac-Jump's trampoline while the trampoline is red. In the Wii U version of the game, since its release, R.O.B. cannot display emotion in the game's Smash mode, which is a visual glitch. However, he can properly emote in most other game modes, as well as on any mode in the 3DS version of the game. R.O.B. 's in-game portrait is the only one that does not briefly emit flashing sparkles when his chargeable attack (Gyro in his case) is fully charged. R.O.B. 's status as a video game peripheral is referenced in Palutena's Guidance to Pit regarding R.O.B., in which Pit suggests calling him "Mr. HVC-012". HVC-012 is R.O.B. 's Japanese product ID. This page was last edited on February 23, 2019, at 14:25.